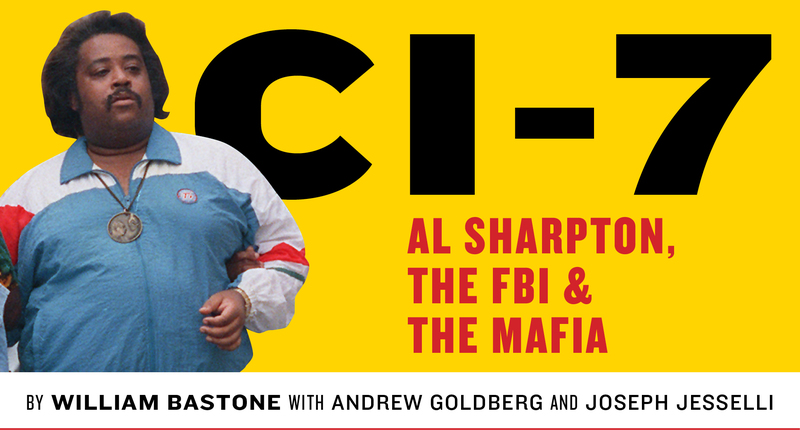 And now for something completely different … From The Smoking Gun, Al Sharpton was an FBI mob informant. It is almost simply implausible to believe that the Reverend Al was an FBI mob rat. Al Sharpton was known by the FBI as “CI-7” worked for the FBI in the mid-1980s and regularly interacted with members of four of New York City’s five organized crime families, specifically leaders of the Genovese family, and he secretly recorded their conversations. Where was the microphone, in his medallion? Just when you thought you had heard it all. 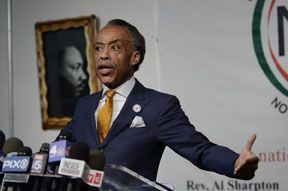 Check out the pics of Al Sharpton at The Daily News … Rev. Al Sharpton worked as FBI informant, taping conversations with mob pals to help bring down Genovese crime family. Sharpton became an informant after he was caught on tape with a drug kingpin discussing cocaine deals, and the feds threatened him with charges unless he flipped and snitched on mafia acquaintances, according to The Smoking Gun. In an interview with the Daily News on Monday, Sharpton disputed much of the report, saying he turned to authorities after receiving threats from Gambino family member Joseph (Joe Bana) Buonanno and others. Five men believed to be reputed mobsters associated with New York’s Bonnano crime family have been arrested Thursday in connection with the 1978 Lufthansa heist at JFK International Airport. The “heist” was made famous in the 1990 movie. ‘GoodFellas’. Huh, I would have thought at this point either those involved in the multi-million dollar heist would have died of old age or been whacked for their involvement in the crime. Many of those who took part in the crime turned up dead to keep their silence. Mastermind of the heist James “Jimmy the Gent” Burke was a member of the the Lucchese crime family and died in prison in 1996. However, it would seem that Jimmy the Gent had some secrets in the basement of his home, now owned by his daughter. Five men believed to be mobsters were taken into custody on Thursday on charges of murder and other crimes linked to an long-unsolved 1978 Lufthansa heist at New York’s John F. Kennedy International Airport, an FBI spokeswoman said. The arrests in the three-decades-old crime, made famous by the 1990 film “Goodfellas,” were the result of an FBI search last summer at the New York home of James “Jimmy the Gent” Burke, said FBI spokeswoman Kelly Langmesser. Burke, the suspected mastermind of the heist, died in prison in 1996 while serving time for the murder of a drug dealer. Robert De Niro played a character based on Burke in the film. 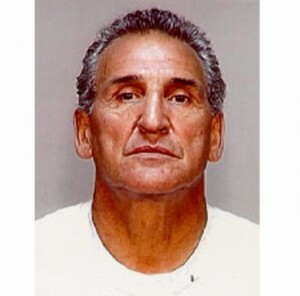 Those arrested were Bonanno family suspects Vincent Asaro, Jerome Asaro, Thomas DeFiore, John Rigano and Jack Bonventre. File this one under, better late than never … Arrests Made in Cold Case Investigation, Including ’78 Lufthansa Heist. The investigation looked at numerous crimes, some predating even the airport heist, including a homicide committed in the late 1960s. The federal investigation first became public in June, when F.B.I. agents descended on a home in the South Ozone Park neighborhood of Queens and began digging in the basement, soon finding human remains, the person familiar with the investigation said. The property was owned by the daughter of the late James (Jimmy the Gent) Burke, the underworld figure whom investigators have long suspected of masterminding the Lufthansa theft. One of the men who has been arrested, Vincent Asaro, 78, is expected to face charges in connection to the airport robbery, according to a second person familiar with the investigation. It is not immediately clear what investigators believe to have been his role. The other men under arrest are not accused of that particular crime. In the end a jury found “Whitey” Bulger guilty on 31 of 32 counts. James “Whitey” Bulger, the reputed and feared former head of Boston’s Winter Hill Gang evaded the law for 16 years; however, justice has finally been served. A jury today found “Whitey” Bulger guilty on 31 of 32 counts that included extortion, money laundering, drug dealing, weapons possession and responsible for the murder of 11 individuals, including a woman. However, the jury found that in 7 cases of murder the jury found that there was not enough evidence and 1 had not determination. On a personal note, I am not sure how the jury came to such a determination on the murders that Bulger was not responsible for. Every Southie knows exactly who was responsible for the murders. Whitely Bulger, the head of Boston’s Winter Hill Gang, was a heinous individuals and should never have been provided the befit of the doubt. This mob POS actually killed women. 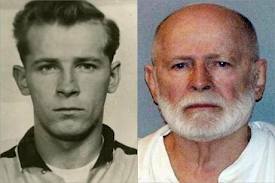 In the end, the 83 year old Bulger will be spending the rest of his life in prison. The turn of events was capped Monday when a federal jury found the former mob boss guilty on 31 of 32 counts — including extortion, money laundering, drug dealing and weapons possession. The jury held Bulger responsible for the murder of 11 people. The 83-year-old Bulger faces a maximum sentence of up to life, plus 30 years in prison. “So many peoples’ lives were so terribly harmed by the criminal actions of Bulger and his crew. And today’s conviction does not alter that harm, and it doesn’t lessen it,” said U.S. Attorney Carmen Ortiz, speaking about the victims and their families. “However, we hope that they find some degree of comfort in the fact that today has come, and Bulger is being held accountable for his horrific crimes,” she said. Bulger was accused of involvement in killing 19 people, including two women.